When screws stop holding within a wood joint, it is usually because the wood fibers around the screw threads have torn away for some reason. Screwed joints get their strength because of the way the threads wedge themselves into the wood fibers, and if wear-and-tear or sudden stress on the joint causes those wood fibers to tear free, the result is a failed joint. This is quite common in places where there is frequent movement of a joint, or when a heavy load is placed on the screwed joint. It can happen at any joint where screws are used, but a very common place for this to occur is where hinges are fastened to doors and door frames. Cabinet doors, entry doors, chest lids, and other such places where hinges are used receive lots of wear and tear. An entry door, for example, has hinges that are stressed thousands of times over a period of years, and it is quite common for the screws holding the door hinges to lose their hold with time. It is also possible to strip the wood if you drive a screw with too much force when you install it. If wood screws are overtightened, the screw threads can tear out the wood rather than wedge themselves between the fibers. Wood can also be torn out if a wood joint is suddenly put under greater pressure than the wood fibers can tolerate—such as when cabinet or drawer with screwed joints is dropped on a hard surface. There are several different solutions you can try when screws loosen or tear free of the wood they are supposed to be holding. As with most repairs, it's best to start with the easiest solution first and move to the more elaborate repairs if they are needed. Several manufacturers offer screw repair kits, which are sold by online retailers and in woodworking outlets. Most of these kits consist of simple plastic anchors and glue. When the anchors are glued inside the screw hole, they provide a surface for the screw threads to grip when you re-drive the screw. While these kits may work for simple, light-weight applications, they are not the best solution for most situations. They are also considerably more expensive than the other DIY fixes you can try. The first fix is to replace the stripped-out screw with one that is slightly longer or that has a slightly larger diameter. Or better yet, use a screw that is both larger (with a higher gauge number) and longer. The threads on the new screws should have either the same type of threads as the old screw or threads that are slightly coarser and more aggressive. More aggressive, coarser, screws have fewer threads per inch (TPI) or a steeper thread pitch. The larger size and coarser threads will ensure that the new screw will bite into fresh wood. Just make that the new screw isn't so large that it splits the wood when you drive it in. Usually, this means going up just one or two gauge sizes when choosing a new screw. And take care not to use too much force when driving the new screw, or it too may strip out the wood again. Once the hole has been already damaged, it will not take much force to do it again. Cut some thin strips or shavings from a piece of scrap wood that's the same (or similar) species of wood. Dip the tips of strips into wood glue and tap them lightly into the hole with a hammer until the hole is filled. Let the glue dry for a few hours. Trim off the strips with a sharp knife or chisel, if they're sticking out of the hole, and sand the area, if necessary. Drill a very small pilot hole, using a drill or an awl, into the filled wood, then drive the original screw into the pilot hole. It's best to cut the strips from the same type of wood as the wood with the stripped holes because it will look and behave the same as the original wood. If you use hardwood filler in softwoods, for example, the hardwood might split the softwood as it expands when the screw is driven in. Or, if you use softwood filler in hardwood, the filler may not be durable enough to hold the screw. For a quick fix—particularly in softwoods—tap a few wooden matchsticks (with the heads cut off) or wooden toothpicks into the hole. You can use a few drops of wood glue in the hole before filling it with matchsticks, but gluing isn't absolutely necessary. The matchsticks are consistent widths and are thick enough that they shouldn't snap off when driving them into the hole. Hardwood dowels also can work, depending on the size of the hole you need to fill. Snap off the matchsticks or toothpicks flush with the wood surface, and sand the surface smooth before driving in the screws. There are some instances where the stick-fill fixes aren't effective. Particleboard and MDF (medium-density fiberboard) are particularly susceptible to stripped screw holes, due to how they are engineered. These products are made with small wood particles bonded together with glue and resins, and they can break or badly tear out when screwed joints are stressed. This makes the standard stick-fill fixes ineffective. Easy fixes may also be ineffective in situations where a heavy door has caused hinge screws to strip out the wood on the edge of the door or the door frame. 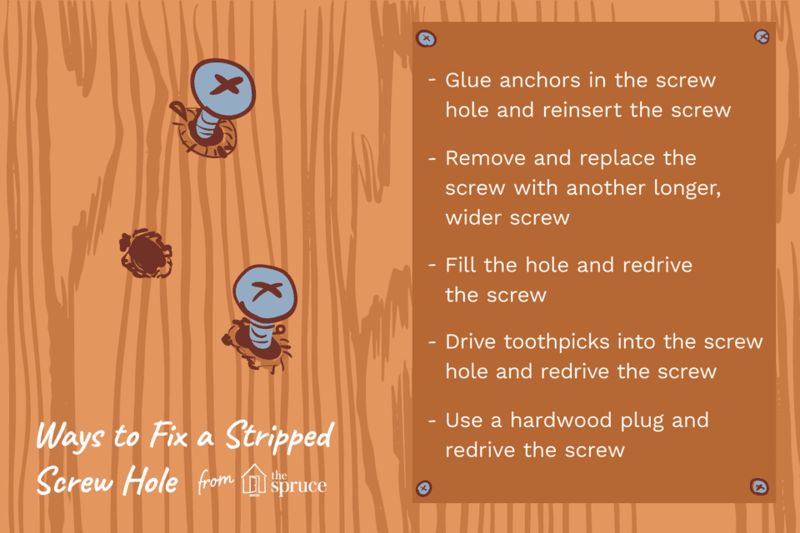 In these situations, the best repair method is to drill out the screw hole with a 1/2-inch bit, then fill the enlarged hole with a glued 1/2-inch hardwood plug or solid hardwood dowel. You can buy hardwood plugs from woodworking dealers, hobby shops, and home centers. Let the glue cure fully (about 24 hours), then drill a pilot hole in the center of the plug and drive the screw into the pilot hole. If the damaged area is badly broken, try gluing it back together before using the plug trick. What Are Nails, Brads and Tacks in Woodworking?